Traveler follows two Yale University graduate students who become suspects when the fictitious Drexler Museum in New York is bombed while they are pulling a juvenile prank. It appears that their friend, Will Traveler (aka Daniel Taft), set them up to look like the terrorists who did the bombing. After the bombing, Traveler disappears and there is no evidence that he ever existed. 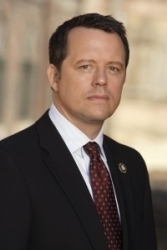 Steven Culp plays the FBI Special Agent in Charge Fred Chambers who tries to catch the students because he holds them responsible for bombing the museum.
. ABC initially ordered 13 episodes of the series but scaled it back to eight late in production. As a result, the writers had to quickly adjust the last episode script.
. Traveler was initially going to air earlier in the season but was pushed back a couple times by ABC. The network had little faith in it, likely because of the poor performance of most other serial dramas in the 2006-07 season.